With just a few items from Dollar Tree you can make this fun yet functional diaper clutch! My best friend is having a baby — actually she is having twins, a boy and a girl! I’m throwing her baby shower and at first I was pretty intimidated, but look at all the cool decorations I found at Dollar Tree. I’m getting ready to send out the invites… now, I just have to figure out how I want to put all the decorations together for a really cute look. I also got some adorable ideas from DollarTree.com for favors, like these candy-filled bottles, and décor. Check out these adorable cupcake stands I made! I was so inspired with my DIY favors and decorations that I decided to make my friend’s gift, too. 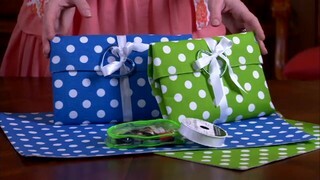 Let me show you how I made this fun and functional diaper clutch. First, cut a piece of ribbon that is about twice as long as your placemat. Next, fold the long sides of the placemat in about an inch and a half on both sides, like this. Then, fold the short sides in about two and a half to three inches on both sides. Now, fold the entire placemat in half so both short sides touch. Pull one of the short sides over the top of the other to create the top of the clutch, like so. I also folded the corners in like this to create a more finished look. Determine the back of the placemat and, using the needle and thread, sew the ribbon onto the placemat. Then, just tie the ribbon around the clutch and you’re done! Unless, of course, you are like me and want to add a few adorable embellishments! This clutch only costs a few bucks to make, but in a diaper changing emergency, it is priceless. I’ll just fill this with a few diapers, some wipes, and my friend can toss it in her purse or car… the best part is the clutch becomes the changing pad so she won’t need to lay her babies down on any less-than-sanitary public changing tables. I hope you enjoyed this Dollar Tree Idea as much as I did! Stop by your Dollar Tree or go to DollarTree.com and see what ideas you can come up with!